The Colorado is a Western icon, a narrow ribbon of water winding through seven western states and two in Mexico (click here for a map of the basin), the carver of the Grand Canyon, a source of cheap hydroelectric power, irrigation for some four million acres of land, water for 35 million people, and home to several species found nowhere else in the world. Although the Colorado River thunders and rages in the nation’s imagination, the reality is far more prosaic. The river is tightly managed and controlled, captured and caged by ten massive dams along its length, its use regulated by treaty, inter-state compacts, state and federal laws, and a host of judicial decisions and decrees. In fact, the Colorado is one of the most intensively managed rivers in the world. Increasingly, the Colorado is a river under siege. In recent years, thanks to an extensive set of reservoirs that can store four years’ average annual flow, the use of Colorado River water exceeded supply. This supply/demand imbalance manifests several ways, most notably in the rapid decline in storage in Lake Mead and Lake Powell, and by the fact that, in more than 90 percent of days over the past seven years, the Colorado River dried up completely, shortly below the last dam on the river. The Colorado is in the grips of a decade-long drought: in 2002 and again in 2012, total Colorado River run-off was among the five lowest years on record. Many in the basin fear that the Colorado may be entering a long period of extremely low flows, akin to the multi-decadal droughts shown in the tree-ring record. Worse yet, current climate change projections suggest that total Colorado River run-off may decline by nine percent or more within fifty years. 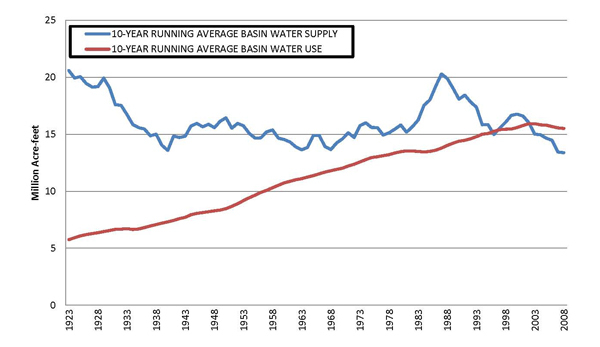 Such a long-term decline in run-off would exacerbate the supply-demand imbalance shown above; it is already forcing water managers reliant on the Colorado to plan for a future in which the Colorado plays a smaller role (see Reclamation’s Basin Study). 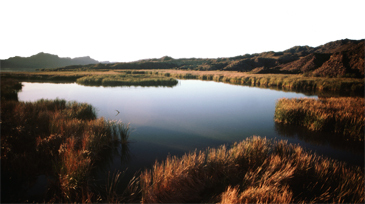 The Pacific Institute has engaged in Colorado River research and decision-making for more than twenty years, from early reports on climate change impacts on the basin, to a 1996 report on sustainable use of the river, to policy proposals for surplus and shortage criteria and the ongoing Basin Study. We have developed pragmatic, feasible solutions to the problems that challenge the river, for the people, fish, and wildlife that depend upon it. Our Colorado River work has also included place-specific research and restoration proposals, for the Salton Sea, the Laguna Reach, and the limitrophe reach of the River. Check out the Publications, News, and Blog rolls on this page for our Salton Sea work. If you like what you see, please support our continued Colorado River work, by contributing here.